I am an orc of my word; some days ago I invited you to write to me with your thoughts and inquiries, and promised I would answer them as is customary in this space. Today I fulfill that promise. I write to you from our outpost in Silithus, as I prepare to begin our movement into Ahn’Qiraj. Perhaps this exercise will be helpful in clearing my thoughts before the coming battle. Let us begin. Sadly, my hectic schedule as acting Warchief does not allow me the leisure time to pursue recreational reading. Fortunately, I do make a point of conducting regular briefing sessions to ensure I am kept abreast of important and relevant information, to ensure that the absence of reading time has not caused me to miss something of import. Do you play Earth Online too? If so, what server are you on? What class do you play? I’m afraid I don’t know what this “Earth Online” is that you speak of. By context, I would surmise it is some sort of diversion or recreational activity involving the internet. Sadly, my schedule already calls for me to spend too much time safeguarding the future of the Horde and saving the world from annihilation for me to invest much leisure time in such matters. Also, I am an adult. If Thrall and Garrosh ever finished that duel they started back before the Northrend campaign, who do you think would win? I could not even venture a guess as to the outcome of a battle between two such mighty combatants; and moreover, I can only hope that such a wasteful conflict might never occur. I must say, I was expecting these inquiries to revolve around matters of greater weight and import. Nevertheless, we carry on. When the orcs began dabbling in necromancy, did you ever consider becoming a Warlock? I know you’re a pretty badass Warrior and all, but did you ever think it might be fun to have demon minions and dot people up? There was never a point when I was tempted to indulge in the fel magics of the warlocks. Indeed, I suspected even then that no good would come of my people’s dabbling in shadow magic. Moreover, I fail even to see the appeal of such practices; I find it much more honorable and rewarding to confront my enemy face-to-face in combat and best him hand-to-hand, rather than standing at a distance and resorting to trickery. There is a certain gravity and satisfaction to be found in feeling the weight and heft of a solid, reliable blade in one’s hands. And besides, I can assure you, if one is sufficiently proficient in the martial arts, one does not need a precarious spell to make one’s foes flee in fear. I’m glad to see someone in charge again in Orgrimmar who’s at least somewhat respectable. I would wish you well in your efforts, except that in this case that would probably entail you actually finding Garrosh, and honestly that would end up leading to more trouble than it would be worth. So, here’s wishing you a mixed bag that keeps you in your current position for a while. While I remain thankful to you, King Varian, for the kindness you showed me in light of the loss of my son, I nevertheless cannot let such denigrations against our Warchief go unanswered. I may remind you, however much good will may exist between you and I personally, I am first and foremost unwaveringly loyal to the Horde, and Warchief Hellscream is its rightful leader. I am myself, indeed, merely a part of which the Horde is a larger whole; and you may no more speak ill of our leader with impunity from me than you might strike one’s face and not expect the hand to respond in kind. 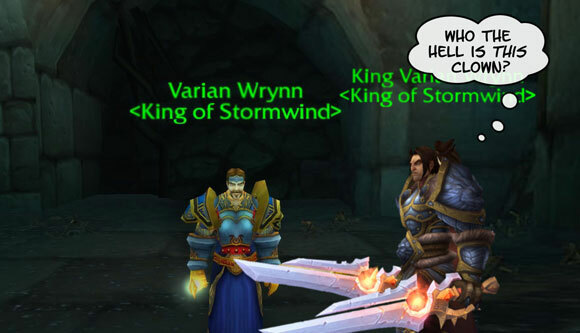 And so, as Warchief Hellscream might comment in his own inimitable manner, I would take this occasion to invite you, King Varian, to engage in an act of self-copulation. If da Lich King’s horse be Invincible, how come I be seein’ it? Vol’jin, I don’t know what it is that you’re trying to accomplish, or why you’ve chosen to adopt this puerile façade, but I would ask of you, please, recall your station. We are leaders of the Horde, and as such it is incumbent upon us to conduct ourselves with a modicum of maturity. I know the Dragon Aspects have a lot on their plate these days, but considering the interest they have in Twilight’s Hammer activities, and the resources and information they have access to, have you considered reaching out to them for support in the search for Garrosh? Maybe have Thrall speak to them on your behalf? While it would indeed pain me to impose upon the hectic schedule of the Aspects, my time in Northrend did afford me the opportunity to develop a certain rapport with the Wyrmrest Accord. As a result, I was recently able to arrange a meeting with Nozdormu at the Caverns of Time. My original intention was to travel to Tanaris on the way to Silithus, but initial preparations detained me in Orgrimmar unexpectedly; fortunately Nozdormu was most gracious over my tardiness (in retrospect, I wonder if he knew in advance that I would be late, all things considered), and welcomed me for our discussion nonetheless. Sadly, Nozdormu was able to uncover no leads that might help us pinpoint the location of the Warchief. His ability to delve into past events is, in fact, somewhat compromised by current activities of the Infinite Dragonflight, which is impeding the Aspects’ plan to retrieve the powerful Dragon Soul artifact from the past. The ways of the Aspects truly are a mystery. One final note in closing: The one aspect of responding to your mail in this format that I do not particularly like is its relatively impersonal nature. Indeed, I wish to apologize to those of you who have written to me directly for not having replied directly in kind. When attempting to log into my “e-mail account,” the machine demanded I provide a password; apparently the device did not find the resulting cleave to be sufficient proof of my identity. By all means, continue to write to me, friends. Honor go with us all. I am pleased to report that our movements against the Grimtotem clan proceed well. Overlord Cliffwalker, who had already brought the Grimtotem in Stonetalon Mountains well under control, has effectively tightened our grip on their encampments; likewise, the two major Grimtotem outposts in Dustwallow Marsh offered little resistance to our forces. Many of them, it would appear, have fled south to Thousand Needles, and many of those who remained readily surrendered when Horde forces arrived and provided first-hand illustration of, shall we say, the Grimtotem’s mathematically untenable situation. As we have several Grimtotem captives on hand, I have placed the tenacious rogue Krog in charge of their interrogation, with the aid of the obsequious duo Dontrag and Utvoch. I anticipate useful information forthcoming; in the meantime, our forces will continue on to Thousand Needles and Feralas, where they will continue to put pressure on the remaining Grimtotem outposts. While our field commanders undertake these operations, I will be traveling to Silithus, where I will personally take command of our troops for the beginning of our strike on the Twilight’s Hammer forces in Ahn’Qiraj. The tide turns in our favor, friends. Honor go with us all. Some days ago I wrote to you in acknowledgement of certain accolades that had been given to Warchief Hellscream for his work on this forum. In so doing, I noted that perhaps I should begin perusing the internet, as it was apparently home to a great many laudable works such as those being recognized by these so-called “Piggie Awards.” True to my word, I have these past few days invested some time surveying – I am told that “surfing” is the descriptive metaphor currently in fashion – the internet. I am both impressed and, indeed, not infrequently horrified. While undertaking my “surfing,” I did make a point of investigating the works of those other bloggers nominated with Warchief Hellscream. I was particularly delighted to discover that on Edenvale’s Gamer’s Fridge blog, the Warchief had apparently volunteered the delicious lemon squares recipe of his dear Greatmother in Nagrand: a treat indeed, and one that I know was always a favorite of my son Dranosh. I find myself once again impressed by the Warchief for having offered this recipe to be freely shared across the internet. Truly his generosity and thoughtfulness know no bounds. In contrast, I was appalled to discover that this same recipe was being offered at a cost by one of our own, Orgrimmar infantry chef Marogg. Upon further investigation, I found that this was far from the only recipe that Marogg was dispensing in such a manner; indeed, it would appear that he had devised an entire system by which recipes could be purchased with “Orgrimmar Cooking Awards,” which even more troublingly can only be acquired by performing menial tasks for this same Marogg. I am, quite frankly, rather enraged that our infantry chef would extort labor from our own people in this fashion. My outrage was magnified, as you might imagine, upon discovering that among these menial tasks was a request for Horde citizens to steal rice from our own people – the less fortunate residents of the Valley of Spirits, no less. I cannot overstate what a vile undertaking I find this entire charade to be. As such, I have relieved Marogg of his duties pending a full investigation of the matter, and appointed his sous chef Gar’dul as head infantry chef. I will write again soon with updates on more pressing matters. It is a well-known aphorism that it is unwise to fight a war on two fronts. While I generally hold to the wisdom of this proverb, we find ourselves in a situation now where conflict has been forced upon us from multiple directions, and appropriate response on multiple fronts is indeed called for. I am reluctant to overextend our forces in such a tumultuous time as now, but circumstance dictates quick and decisive action in a number of directions. Our forces have successfully mobilized in Silithus and have surrounded all points of entry to the Temple of Ahn’Qiraj. Garona Halforcen has returned to the zone and is coordinating the positioning of our troops with aid from the arenaceous field commander Krug Skullsplit. In the process of moving our forces into position, several of our battalions passed through regions marked by various Twilight encampments; these nefarious outposts are now, one might say, severely understaffed. Now that we can be confident that no Twilight forces will be able to escape Silithus, we have begun laying plans to send forces into the temple to put an end to the Twilight threat altogether. Meanwhile, we have the Grimtotem to deal with. 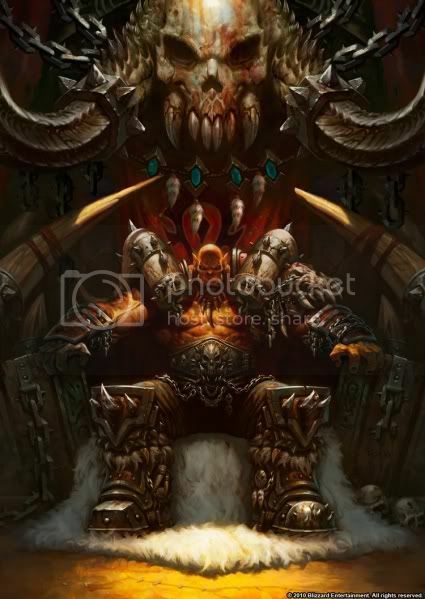 While Magatha Grimtotem has not been seen since her flight from Thousand Needles – an escape facilitated, I am told, by the ignominious blood elf Johnny Awesome – the testimony of Dontrag and Utvoch confirms the Grimtotem presence on Alcaz Island just prior to Warchief Hellscream’s disappearance. We are therefore undertaking a systematic sweep of all known Grimtotem settlements, both to investigate for further possible clues to the Warchief’s whereabouts, and also to demonstrate through appropriate force the severity of the actions that have been taken by their tribe against the people of the Horde. I have sent the adumbral investigator Krog back to Brackenwall Village in Dustwallow Marsh, where, together with Nazeer Bloodpike and the ogre chieftain Tharg, he will arrange a series of strikes against the Grimtotem of Blackhoof Village and Direhorn Post. Meanwhile, I have authorized Overlord Chieftain Cliffwalker of Stonetalon Mountains to escalate his already highly effective activity against the Grimtotem in that region. Our actual military activities will focus on these areas while Horde forces in Feralas and Thousand Needles begin to make preparations to begin strikes there as well; as the outlying regions are secured, we will redirect forces to further support the newer operations in neighboring zones. To any Grimtotem who might see this – I know not how adept the Grimtotem as a people may be in the ways of the internet – I would offer this counsel: surrender and offer full cooperation to Horde forces when they arrive. It will save all of us time; it will save you, most certainly, a great deal of suffering. It has been suggested to me that it may be unwise for me to speak directly to the Grimtotem in such a fashion here, or, indeed, to lay out our plans where hostile eyes might see them. Foreknowledge of our activities, so the reasoning goes, will only enable the Grimtotem to prepare and counter our actions. To this I would respond from the experience of many battles: foreknowledge of a threat only affects the outcome where the threat itself was marginal to begin with. If you look out your window and see a fiery meteor the size of Coldarra hurtling down toward you, rest assured that your knowledge of its coming will not in any way empower you to prevent your house from shortly being replaced by a burning crater. I will continue to keep you abreast of developing news, friends. Honor go with us all. As I believe I have made clear on at least one occasion, I am admittedly not as familiar with the ways of the internet as are my younger colleagues. As the latest illustration of this fact, I was not aware that this forum allowed for its readers to reply directly to my letters, in the form of “comments” that are appended to the end of my message. This was, however, brought to my attention by my calligraphically adroit aide Mokvar, by way of his directing my attention to a response to yesterday’s message. In it, a reader rightfully praised Warchief Hellscream for his efforts in the creation of this blog, and moreover alluded to a more official recognition conferred a few short days ago. As I have had confirmed by the telecommunicative goblin Spazzle Fizzletrinket, Warchief Hellscream was recently the recipient of an honorable mention in the category of Most Noticed Blogger Breakthrough in this year’s “Piggie Awards” as presented at MMOMeltingPot. I will confess, I do not understand what this means. Nevertheless, it is doubtless a very great honor for the Warchief, one for which I heartily congratulate him, and moreover, since I am currently serving as acting Warchief myself, I feel it only appropriate that I should accept this accolade on Warchief Hellscream’s behalf. Therefore, I wish to thank whatever persons or entities are responsible for the awarding of this honor. I do not know what the process of nomination entails, or indeed if there is one, and even if there is, I am unsure of exactly how one advances from nominee to award recipient. Presumably it does not involve honorable combat, as the Warchief would not have been present of late to participate; though I suppose it is not out of the realm of possibility that his would-be opponent would have seen his matchup and, assuming the attempt would be futile, forfeited the match without having learned of Warchief Hellscream’s current situation. In any case, I would like to offer my heartfelt thanks and appreciation to whoever may have been involved in the nomination, and/or voting, and/or vetting, and/or selection that led to this award, provided that there were people undertaking such things in some form. I would also like to recognize nominees Stubborn of Sheep the Diamond, Niki “Edenvale” Casselberry of Gamer’s Fridge, and the writers of Flavor Text Lore; fellow honorable mention recipient Bravetank of the eponymous blog; and of course, my highest respect and honor to this year’s winner, Apple Cider of Apple Cider Mage. Again, I would beg my readers’ forgiveness for the fact that, in all candidness, I do not know who any of these people are. I am assured, however, by the digitally bookwormish goblin Mr. Fizzletrinket, who is familiar with the works of the above authors, that this recognition is well-deserved indeed. I may in fact need to make an effort to begin perusing this internet of which I’ve heard so much, as it would seem I am missing out on a great deal. Turning back to more corporeal concerns, the investigation is progressing steadily, and I will have a number of updates and thoughts to share with you all in my next letter. Thank you once again on behalf of Warchief Hellscream, friends. Honor go with us all. It has been brought to my attention that one of Warchief Hellscream’s frequent activities on this forum was to respond directly to messages sent to him by you, his readers. I find myself increasingly impressed with the Warchief’s devotion to his people, which would drive him to engage so directly with your concerns and interests. While I make no pretense that I shall provide nearly the insight or inspiration that Warchief Hellscream doubtlessly did routinely, I wish to encourage you to continue your custom of writing in with your thoughts and questions. It is my understanding that these messages typically are sent through a new mechanical form called “e-mail,” which I am told is much faster and less cumbersome than conventional letters. 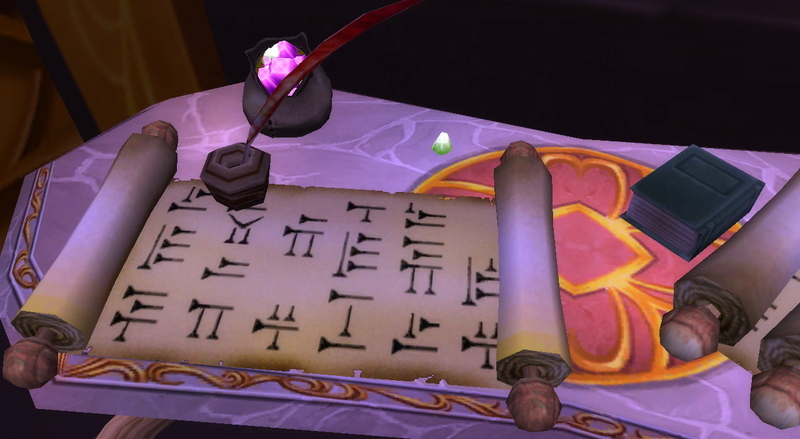 The technologically dexterous goblin Spazzle Fizzletrinket assures me that he is able to access these messages on my behalf through the Warchief’s “e-mail account,” and will be able to provide paper copies to me for response. I will do my best to answer your questions as forthrightly as due prudence allows, and will of course give your thoughts the weight and consideration they are due. I look forward to our future correspondence. I offer my apologies for the tardiness of this update. As you may well imagine, however, these have been hectic days in Orgrimmar, and I fear that my daily activities have left little time to attend to my authorial duties as I know I should. The search for Warchief Hellscream continues. At present I cannot, unfortunately, report his safe return, but I remain hopeful that we will find him and bring him back to safety. Horde agents are pursuing a number of possible leads as to his whereabouts; in the meantime, I shall take this opportunity to provide you with further detail as to where the investigation stands. As I noted in my previous message, Horde forces arrived at Alcaz Island some hours after Warchief Hellscream’s departure from Orgrimmar. Upon their arrival, they found no sign of the Warchief, nor of the schizophrenic ogre Skarr, but did observe signs of struggle across a considerable span of the island, in particular in the area immediately surrounding one of the many naga conjuring circles that mark the terrain there. In the nearby jungle, scouts found the Warchief’s personal wyvern, wounded and disoriented (which, I am informed, led to some minor lacerations prior to its recognition of the friendly nature of the orcs who found it). The wyvern’s presence at the island confirms that the Warchief did indeed arrive at Alcaz Island, and was not, as some suspected possible, intercepted en route. Further investigation of the island revealed an elaborate system of underground tunnels, perhaps utilized at some prior time by the infuriatingly rasputinian gnome Dr. Weavil, who had taken up residence on the island at roughly the same time as the Qiraji War Effort. While a painstaking search of the tunnels produced no concrete evidence of Warchief Hellscream’s presence, it did uncover, unconscious, the missing verbose soldiers Dontrag and Utvoch, who had been sent to delivery Skarr to the island as part of the Warchief’s original stratagem. Upon recovering consciousness in Orgrimmar, Dontrag and Utvoch reported that shortly after their arrival at the island, they were attacked by a large contingent of Grimtotem raiders. Unsurprisingly, the insidious ogre Skarr seized upon this opportunity to turn on the orcs; they could recall little else after this point, as it was doubtless at this time that they were knocked out and dragged to the tunnels. Based on their testimony, it would appear that the Grimtotem succeeded in gaining control of the island prior to the Warchief’s arrival. At present it is unclear whether Magatha Grimtotem herself was present for the attack, or whether she arrived at the island at any point thereafter. I have dispatched the intrepid investigator Krog to the island to scour for any further evidence, and in the meantime I am conducting an exhaustive survey of all Grimtotem encampments and activities in Kalimdor. Since it is clear that their involvement in the affair is deep, I have concluded that a thorough – and emphatic – response is called for. I shall provide further updates as time allows, friends. Honor go with us all.